Issue with 1.5rc1 on handling mutiple objects on change html and append function. #8072 is a duplicate of this ticket. ​reduced test case happens in every browser. The cause for this regression is similar to the one for #8052. Check ​my comment there for more information. Basically a recent optimization to the clone method with this ​commit makes wrong assumptions about the existance of getElementsByTagName on DocumentFragments. jitter, thanks for digging through this one - I'll get this fixed as soon as possible. Unfortunately there were no test cases for this in the test suite. No problem. Yes it's a shame. After figuring this one out (easy after debugging #8052) I too was thinking. "WTF, this didn't make the whole test suite trip over?". Don't hurry, you only need to fix it before monday. :D Or just hit the bail out button. Do you have a fix for this that doesn't compromise the perf optimizations? If you do - then we should move forward with it. I'm afk (answering from mobile phone) for the next few hours. 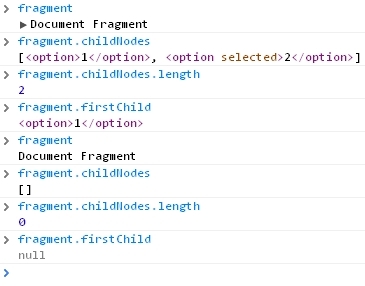 Inside jQuery.buildFragment(), a Document Fragment is created, in the case of these <option> elements, the fragments appear empty (firstChild is null), except when you check fragment.firstChild, the option is there. fragment.childNodes IS empty. I can't seem to reproduce your findings regarding the DocumentFragment just "looking" like it's empty. Neither in Opera 11 (​http://i.imgur.com/o6m6P.jpg) nor in Chrome 8 (​http://i.imgur.com/bRRSW.jpg). The Fragment is really empty to me on the 2nd iteration when inserting 2 options. [...] various operations [...] take DocumentFragment objects as arguments; this results in all the child nodes of the DocumentFragment being moved to the child list of this node. So you maybe you hit a browser bug there, Chrome 10 ;) I guess? I toyed some more with the test case and added some comments ​test case with comments. 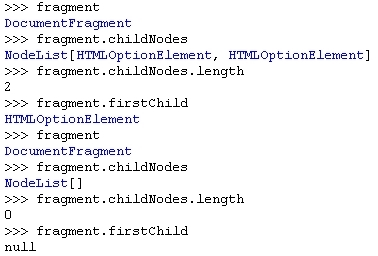 Now there also is a test showing this hasn't got "anything" to do with option elements but with bogus behavior if the fragment returned isn't cacheable and contains more then one element which needs to be appended. So something with that conditional isn't working right. Although this wouldn't fix the underlying issue, it would be interesting to see a proof for the behavior described in this ​comment. I can't seem to reproduce this problem. test/unit/manipulation.js Line 411 "append the same fragment with events (Bug #6997, 5566)"
Use the original element/fragment as the last item to be appended to the document instead of the first in order to prevent missing elements when appending to multiple elements. Fixes #8070.